When we think of the basic necessities of life, we are bound to think of food. Our dietary requirements are mostly fulfilled by cereals, pulses, vegetables and fruits. All these are grown by our farmers on vast stretches of land. As per World Bank estimate in 2015, 60.45 % of total land in India is agricultural land. India’s arable land of 159.6 million hectares is the second largest in the world. India’s agricultural scenario is definitely a success story. From being a country dependent on imported food-grains to one that exports its surplus production, we have come a long way. Our food-grain production rose five times in six decades. In 2017-18, India’s food-grain production touched a record 277.49 million tonnes and the agriculture ministry is targeting a record 283.7 million tonnes of food-grain production in 2018-19. As some scientists contend, we might have broken out of the Malthusian trap post-industrial revolution. (Malthusian Trap is a condition when excess population stops growing due to starvation as a result of shortage of food supply. This would prompt technological advances which would increase a society’s supply of resources, such as food, enabling population growth. This would then bring the per capita supply of resources back to its original level and the cycle would repeat). However, with the human-population projected to touch 10 billion and that of India is expected to reach 1.7 billion by 2050, food crisis seems imminent if we don’t act now. While talking about increasing food production, we need to remember that land is a limited and increasingly diminishing resource due to degradation of soil, sometimes beyond repair. On average, 80% of fresh water is used in agriculture and other allied activities; and use of pesticides, fertilizers etc in agriculture is a major source of freshwater pollution in an increasingly thirsty world. The solution to the food crisis in the future could be having Vertical farms. 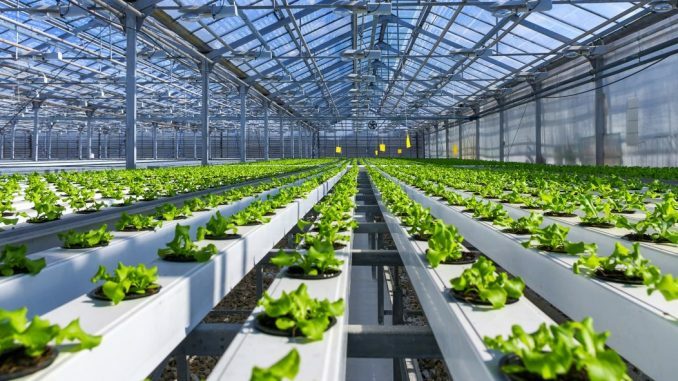 Vertical farming involves growing plants in a vertical orientation: in vertically stacked layers or in vertically inclined surfaces as against the conventional horizontal spread. This implies that our farms should follow the trend of our buildings i.e. from being single storied to being multi-storied. This practice will maximise the output from a given area. An interesting aspect about vertical farming is that these farms can be present in cities as it requires high rise buildings. Vertical farming makes use of controlled- environment agriculture (CEA) technology where all environmental factors are controlled. In these farms, light, humidity, temperature, gases etc are all adjusted to suit the requirements of the plants. Some vertical farms use techniques used in greenhouses such as using natural sunlight and solar heating during the day, while some farms are lit by LEDs that mimic sunlight. Vertical farms are generally hydroponic systems where plants are grown without soil in mineral nutrient solutions (aquatic based environment). With proper management, such systems do away with herbicides and pesticides. * Vertical farming ensures crop production all year- round as the environmental factors are controlled. * Vertical farming increases crop production per acre. According to Ecologist Dickson Despommier, a building 30 storeys high with a basal area of 5 acres has the potential of producing crop yield equivalent to 2,400 acres. * Protection from weather related problems, as the crops grown under controlled environment will be safe from droughts, floods etc. * Vertical farming in hydroponic systems use 70% less water compared to traditional farming. * Vertical farming reduces by a hundred fold the necessity of utilising land for food production. The older farms could be re-converted to forest lands. * Vertical farming results in energy conservation. Growing crops in urban centers will reduce the consumption of fuel used in transportation. So, for those of you who like tending to plants as well the hustle bustle of a city life, you should probably think of working in an urban farm!